Around 1660 Pieter de Hooch moved to Amsterdam from Delft, in whose painters’ guild he is recorded in 1655 and 1657. He remained there for the rest of his life apart from a trip to Delft in 1663. In the 1650s De Hooch started to paint scenes of taverns with soldiers, then moved on to domestic interiors and courtyards in which he depicted the life and customs of the prosperous middle classes. These simple interiors, in which the figures — particularly housewives — are seen engaged in their daily tasks, declined in quality at the end of his career, becoming somewhat stale and less delicate. At this late period De Hooch located his figures in more complex, elaborate settings. The space in his paintings is constructed through the light and geometry of the room, creating environments in which the atmosphere is palpable. The present canvas is a good example of the type of interior painted by this artist. Although dating from his Amsterdam period it retains the charm of his Delft works. The canvas was subsequently re-painted, possibly during the 19th century, modifying the composition. These additions affected the rear wall with the doorway, whose lintel was reduced in size, while a curtain was added next to the chair. In addition, a further painting was added above the doorway and the decoration of the room was enhanced with a sculpture of Mercury. These modifications, which substantially altered the composition, were removed in 1958. Between 1884 and 1892 the painting was inappropriately cleaned, resulting in the disappearance of the original signature, which we know was located at the lower left corner. De Hooch depicts a typical Dutch interior. The mother is busy sewing but also attends to her small son. They are located in the area of the house known as the voorhuis, which connected with the exterior and when not used for conducting business was a space for domestic activities. The second room, which connects with this one through a door and an interior window with a grille, is the binnenhuis, in this case with a large fireplace. The woman is seated on a dais or soldertien that offered protection from the cold and damp of the floor, while behind it is a richly worked leather hanging that functions as a back to the bench. De Hooch partly organized the space through the floor tiles whose design creates a diagonal, but primarily through the light and the counter-play of the illumination that enters through the window on the left, projected onto the wall and the woman, and that of the inner room, which is reflected on the tiles and fills the entire space. 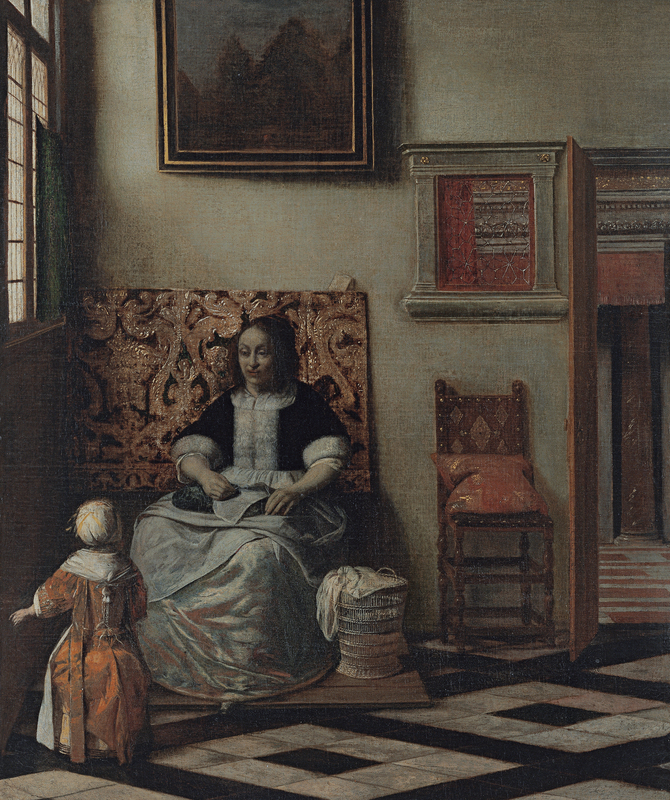 Discussing paintings of this type, Peter Sutton emphasised the role of women in Dutch 17th-century society as educators of children and organisers of the home.